Mophie most innovative new product yet it called the Space Pack – a battery case for the iPhone 5s and iPhone 5 that although may look a lot like the company's Juice Pack series of battery cases externally, it's the world's first battery case to feature built-in flash storage. 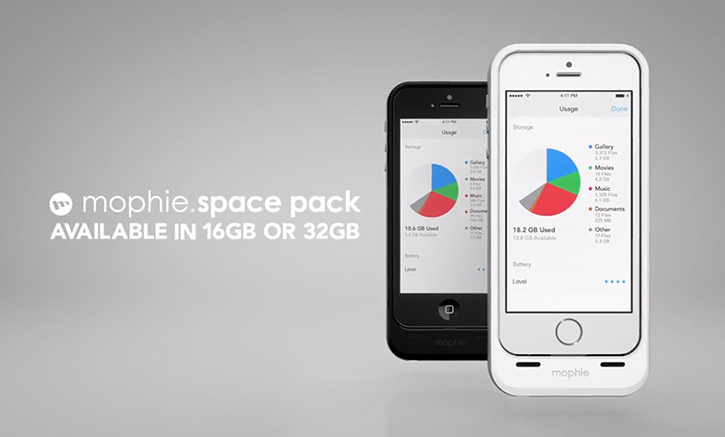 Mophie's new Space Pack battery case comes in 16GB and 32GB storage capacities that expand your iPhone's stock internal storage capacity using Mophie's iOS app allowing you to shoot thousands of additional photos, and store a lot more movies, music and documents. You'll also be able to access the Space Pack's internal flash storage using your computer. The Space Pack also comes standard with a built-in 1700mAh rechargeable battery, which Mophie claims will double your iPhone's battery life. It'll be available in matte black and glossy white for $149 (16GB) and $179 (32GB). The Space Pack is currently exclusive to the iPhone 5s and iPhone 5.